Wait, what? Respawn has a new game? Yep. The company revealed and released Apex Legends this morning. Is it a new Titanfall? Kind of. It’s a battle royale game set in Titanfall’s universe. The action takes place 30 years after Titanfall 2 and focuses on mercenaries competing with one another in a huge arena. No. But don’t go! 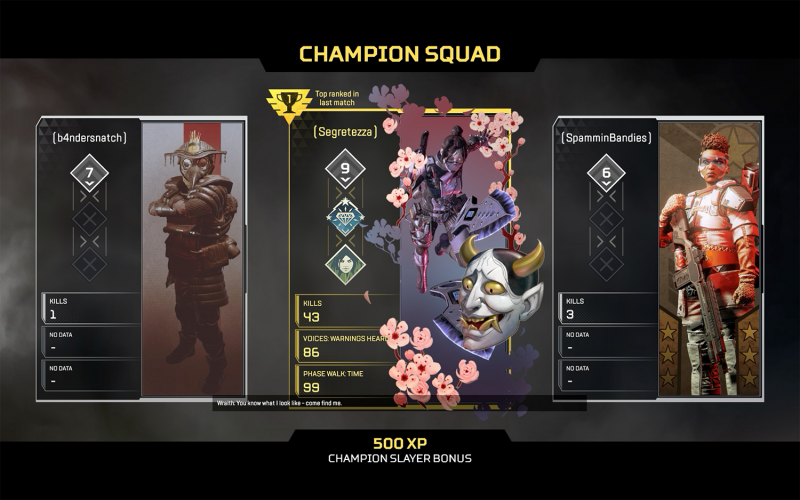 Apex Legends is pretty good even without them, and there’s a good reason for not having them in there that you can read about here. Also, the game’s free. What makes it different than the other battle royales? Apex Legends is a character-focused battle royale, which means you play as legends as opposed to just commandos running around the map. Think of them as analogous to Rainbow Six Siege’s specialists or Overwatch’s heroes. Every one of your characters has a special set of powers that can benefit your squad. Lifeline, for example, is the medic of the group. She can summon a little droid to heal you and can even pop a massive shield to guard you and her while she revives you once you go down in battle. Meanwhile, Gibraltar is a tank who can pop a massive dome shield to give you cover, while Wraith can zip around invisibly to ambush enemies. Legends bring a surprising amount of streamlined innovations to the battle royale genre. A pinging system, similar to Battlefield’s marking system, makes playing and communicating with random players much less of a hassle. The jumpmaster system also means there’s one player at the beginning of each map who controls the drop-in, guiding all three of you toward a destination. However, if you’re worried that your jumpmaster is leading you into certain doom, you can also break away from the squad and fly elsewhere. So all of these character abilities are going off… during a battle royale game? That sounds like chaos. How many players are in a match? 60 players at launch, split in 20 squads of three. Respawn has said the player count might go up. Very interior-focused, which I think is a good thing. There are tons of apartments to hide in, caverns as well. The map doesn't have a lot of open spaces like plains, so snipers aren’t going to dominate this game like they sometimes do other battle royales, especially since a number of character abilities can help sniff them out/bypass them. Right now Apex Legends has no solo mode. You can break away from your squad if you really want to tough it out against everyone else’s squads on your own, but it’s not recommended. But seriously, no titans? Why? No titans. No pilots. As for why, Respawn explains in-depth here how prototypes with those two units just didn’t work well in the battle royale setting. No parkour. Basically, the qualities that are retained from Titanfall 2 are the gunplay and speedy movement. One character, Pathfinder, can use a grappling hook and set up ziplines, but yeah, no parkour. I’ve played about five hours of the game and love it so far, without titans or parkour. I don’t think it needs them, to be honest. You can read my impressions right here and we’ll have a review later in the week. Six at startup, with two you can unlock by making your way through the progression system and acquiring currency, so eight in total. All of them have abilities that compliment one another and make up for interesting squads. Respawn plans to roll out new characters as the game grows and evolves. What do you unlock in progression besides those characters? All the unlocks are cosmetic weapon and character skins. There’s also a banner card you get to decorate with statistics like “foes killed” and “matches won.” You acquire these skins by loot boxes or buying them outright with in-game currency. Yes, Apex Legends has loot boxes. However, the algorithms for them are set up so that every box you get that doesn’t have a legendary or rare item means that it’s more likely the next one will. You will also never get a duplicate, according to Respawn. Is the progression system predatory? One of the reasons we’re holding off on reviewing the game is because I need some more time with the progression system to see how it plays out over long term. What Respawn has said about the progression system, and what little I’ve seen of it, seems like it’s tilted in the favor of the player though. Do you like Titanfall 2? Do you like battle royale? Apex Legends is free, so there’s no harm in trying it out even if you’re skeptical. You can watch our episode of New Gameplay Today below to see if the game seems up your alley! 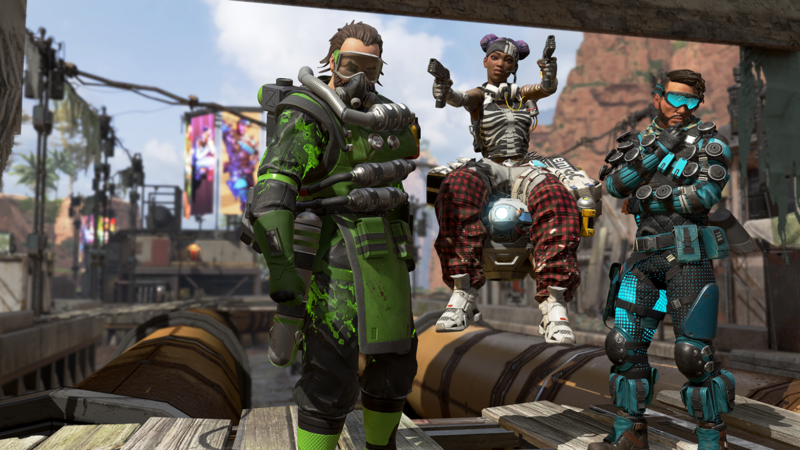 For more on Apex Legends, check out our impressions and tips. You can also read our interview with Respawn about the game's development and its relationship to EA here.